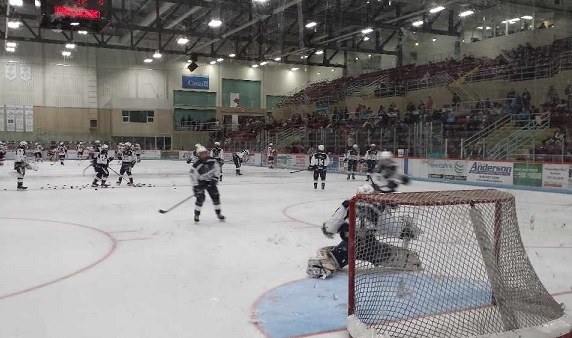 Fans can check out the Woodstock Navy Vets home opener for free tonight at the Southwood Arena. WOODSTOCK - The PJHL season kicks off tonight in Woodstock with the Navy Vets hosting the Paris Mounties. The Navy Vets are once again letting fans in tonight free of charge to help kick off the season. Puck drops at 7:45 pm at the Southwood Arena. The Navy Vets are looking to build off a successful season that saw them finish in 3rd place, just 5 points out of first place. Last years home opener drew 1,500 fans and they hoping for a similar crowd tonight. Peter Crosby will make his coaching debut for the Navy Vets tonight. The home opener is being brought to you by the Lions Club who will be at the game promoting the Terry Fox Run on Sunday at College Avenue Secondary School starting at 10:00 am. Other local games tonight have the Tavistock Braves hosting the Ayr Centennials for a 7:30 p.m. start and the Norwich Merchants welcome the Wellesley Applejacks to town for an 8 p.m. start.